Ok, so here is my first review. One day an alien creature called a neighbor invades Mikado City. Modern weapons are of course useless against it, until a mysterious group called border uses mysterious devices called Triggers to defeat the beast. So now, Border is the official neighbor exterminator. Enter Osamu Mikumo, a quiet junior high student with glasses (they mention this alot) who is also a member of Border. He soon meets a white haired boy named Yuma who has transferred to his class and has a mysterious aura about him(me thinks the white hair shoulda tipped him off). Anyway, Yuma gets into trouble with some bullies shenanigans happen and we are at a forbidden neighbor emergence area(two guesses what happen). A neighbor shows up about to devour the bullies until Four-Eyes comes to save them...only to get beaten back and about to get killed himself. Then our white haired transfer student, springs into action wearing a black suit and defeats the neighbor... revealing that he himself is a neighbor too. Enough with the synopsis. What's on our plate? Well this is the newest Shonen Jump adaption so if this scares you off jump ship now otherwise strap in for something amazing. Don't let the stereotypical premise scare you off this is good. Having read the manga I will agree that the first episode is pretty blah, and nothing special. Give it a good five or six episodes and then make your choice. Now one thing I have to give a special mention towards is the animation. I have heard horror storys about Toei and their bad animation, but having watched One Piece, I did not know what they were talking about. No more now 'cause I tell ya what the were right. The animation is abysmal. Freeze frames, still shots and messed up faces from afar. Really bad stuff, but I still had a smile on my face through this whole thing that it didn't matter. Yes the animation was bad. Yes the plot (so far) is meh, but trust me it gets much much better. So while I would give this a 5 the shameful animation drags it down to a 4. P.S.-You will be seeing this =3= face a lot, trust me its here to stay. So don't fault Toei on that one. The most low budget animation I've ever seen(not including the backgrounds), constant freeze frames, awkward characters, DISPROPORTIONATE bodies, etc....The only reason you should watch this is for an example on how a good story can't hold up a show on it's own. To the people who say ignore the quality of the animations: First of all why would you not take into account the animation of an animated show. Some of the other reviews I read were that you should just stay for the plot. If you want to do that then go ahead, but if that's the only reason you're going to watch this show then you may as well just drop it and pick up the manga. It has the same feel, the same story, and the same characters. It's even ahead of the show. Great series, but unfortunately animated by Toei. Nice story and good characters, story will undoubtedly get better. Great voice cast for characters who are rather colorful. Only problem is the animation, which is pretty bad at certain points. The animation for the series makes me feel it's been given a low budget to work with. But if you can overlook the animation, the series is decent in all other aspects. Animation is it's one problem in my opinion, the story has a slow but good start and will only get better. So I would say give it a shot if the animation doesn't scare you away. People judging this as "sub-par animation" are being WAY overly pretentious. Watch it for yourself and judge. While the animation isn't OMG jaw dropping, it's not nearly as bad as it's being made out to be. Belittling and prejudging something just because you don't like the production company is dishonest, biased, and overall just a petty and immature mindset. Also, just to add: the complaints about the faces being made are off base. The reason they are drawn that way is because it's being a faithful adaptation of the manga. the reviews that give low stars are all based on one thing, the animation quality. not the quality of the show. by quality of the show I mean story, action, plot, char. development and voice acting, things like that. this really isn't my review on the show just trying to prevent people getting scared away thinking the whole show is bad. only one ep. so far so I will hold my review after I get a better feel for it. great characters and plot line. the story centers around the appearance of one of the neighbours "the equivalent of humans from anther dimensions exactly what this mean is not revealed at the time of this review" in the life of the main character. the show looks promising and the animation style is great if different from the norm. if you like the sound of this plot line try watching it. Interesting story, rough animation, could be better. The premise is interesting enough to keep me watching and see this anime through, characters themselves seem pretty solid, the animation is notably rough. Not only in the art style, but how we go from scene to scene. (even when the ''camera'' switches) It's not fluid at all, and throws me off. Also there are plenty of moments where we are just staring at freeze in the animation for what feels like a long time before someone moves and or says something. Though, I feel this is due to a low budget, not them being cheap. It's as if they are using any and all tricks to lower the cost of making this anime. Which I'm alright with, as long as the characters are enjoyable, and story remains solid then I'll pull through. I've been watching anime for a long time now and to those who say the animation is lacking, i say your imagination is lacking. This is definitely not Ghost in the Shell quality animation, but the entertainment value is there. It's got a good amount of comedy mixed in with the action and it keeps the viewers attention very well. Personally, i really enjoy the artistic liberties taken with Kuga's facial expressions. They're part of what makes anime great!!! Give this anime a try, you won't regret it. Too early to JUDGE! Give it a chance! This is one of those series that builds good momentum. you have to stick with it and be patient until it gets really good! The first episode alone doesn't do it much justice, especially for newcomers who haven't read the manga, but the beginning is very reminiscent of Naruto's!! 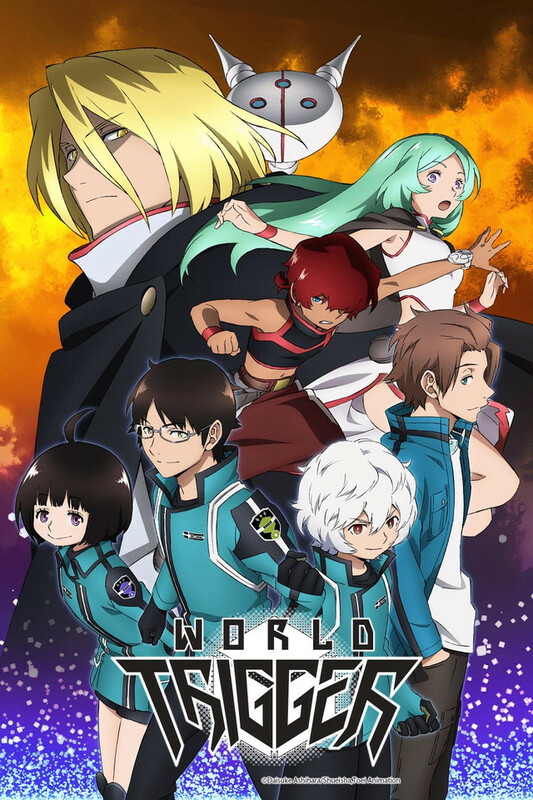 I love this manga series - excellent worldbuilding and so well thought out, with engaging and well-developed characters - so am really excited to see how the anime evolves. Absolutely frustrated by how poor the animation budget is though. Will definitely keep watching but if it weren't for my faith in the quality of the manga I'll admit the anime on its own isn't as grabbing.